Banyu Pinaruh ritual is a day of cleansing, ritual for self-purification. This celebration is held every 210 days (every 6 months in the Balinese calendar) and fall on Sunday or Redite Paing wuku Sinta, a day after Saraswati. This is the starting point of the new Wuku Cycle. Banyu Pinaruh comes from two words namely "banyu" which means sacred water and "pinaruh" which means knowledge. It is meant as a celebration to invoke sacred water of knowledge. The Saraswati celebration fell at the end of wuku Watugunung (the last Wuku), while Banyu Pinaruh fell at the beginning of wuku Sinta (the first wuku). On this day, the offerings to Goddess Saraswati are washed out to sea or a body of flowing water, while the edible part of it can be consumed like fruit, cake and more. This is considered a very good time to cleanse the body with holy water or melukat. The ritual is physically interpreted as body cleansing, while spiritually as purification of negative energy. A holy water celebration before re-filling our self with pure knowledge in the new cycle. 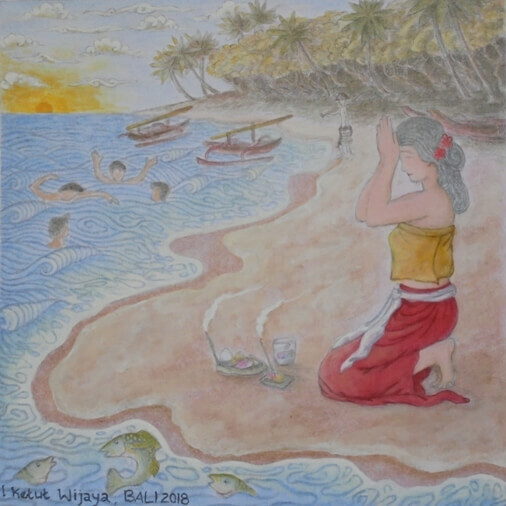 Since early morning (before 06.00 am) the Balinese flocked to the water source such as: springs (kelebutan), campuhan (river), waterfall, beach or lake to do self-cleaning (have a swim or wash themselves). This ritual can also be done in their own homes by using water "kumkuman", water containing a mix of fragrant flowers. The ritual begins by placing offerings, performing worship (muspa), then washing, bathing or shampooing. The ritual has become a tradition to perform self-purification also with relatives. This activity rejuvenates the energy and gives a balance between body and spirit.